This December, British ESA Astronaut Tim Peake will be taking two specially augmented Raspberry Pis called Astro Pis to the International Space Station (ISS) as part of his six-month mission. 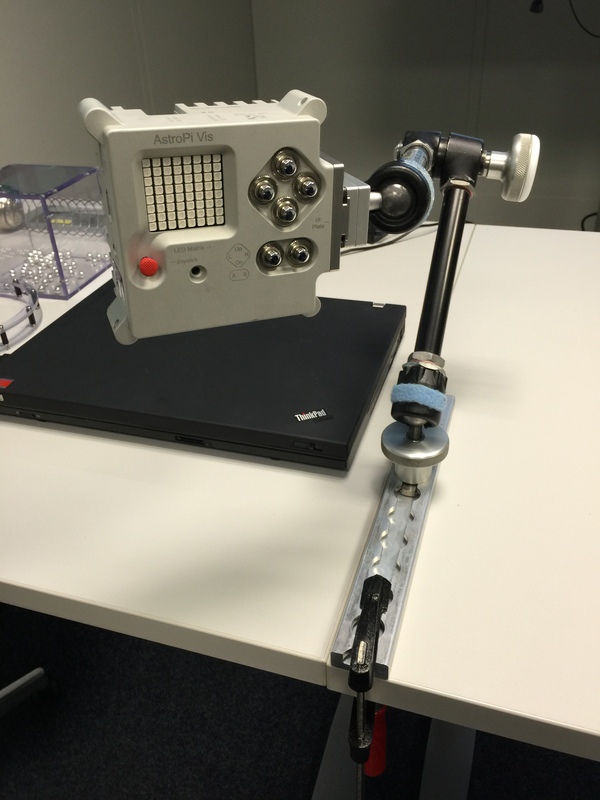 These Astro Pis will be running experimental Python programs written by school-age students; the results will be downloaded back to Earth and made available online for all to see. Here’s Tim at the European Astronaut Centre in Germany just after completing his training on our payload. The plan thus far had been for the Astro Pi payload to launch into space aboard the Soyuz 45S, the same rocket Tim will use to get into space on December 15th. A fortnight ago, though, the UK Space Agency warned us that there had been an overbooking of cargo on the flight, and that we might be bumped off. We’re an educational payload and understandably of lower priority than important supplies like food and water. Our weight is 1.3 kg and the Soyuz rocket has capacity for only 60 kg of cargo after the crew and all of their luggage is on board. Other options for launching us were SpaceX 8 in January or Progress 63P in February. Before we had time to allow ourselves to feel any disappointment over the possibility of not flying with Tim, though, the folks over at ESA got us onto an earlier flight with a planned launch date of December 3rd. The payload will now arrive at the ISS a few days before Tim does, so we’ll be there from the start after all. 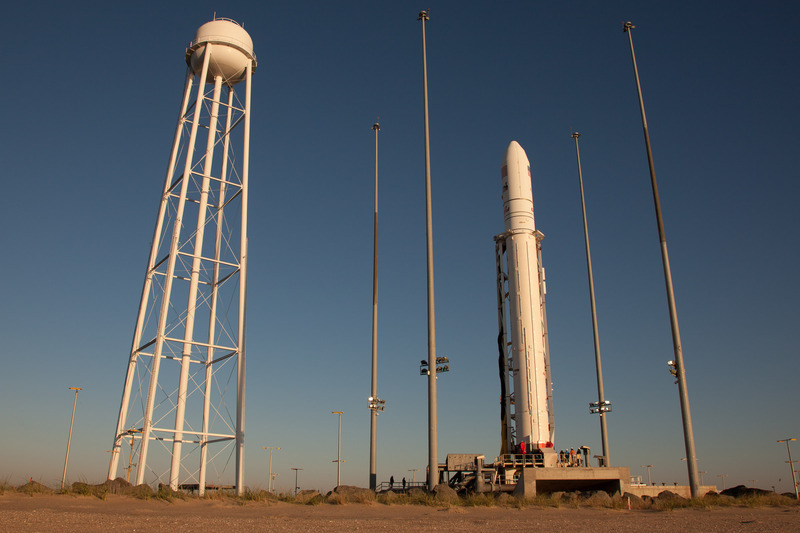 We’re going to launch on Orbital Sciences’ Cygnus cargo freighter on its fourth mission to the ISS. The planned launch date is December 3rd at 22:48 GMT. Coverage will be via an internet live stream only. Frank DeMauro Vice President of Orbital ATK’s Human Space Systems Programs provides an overview of the OA-4 mission to deliver cargo to the International Space Station. Orbital Sciences has a contract with NASA to provide commercial cargo resupply services (CRS) to the ISS. They developed the Antares rocket, a medium class launch system, to carry the Cygnus into space. As a reminder to everyone that nothing in space flight is guaranteed, the last Antares rocket exploded moments after lift off. This was found to have been caused by a problem with the Antares rocket system itself; while it undergoes a long overhaul, Orbital Sciences have contracted United Launch Alliance to conduct their next cargo resupply mission using the older Atlas V rocket. This is a launch configuration that hasn’t been used before (an Atlas V with the Cygnus spacecraft mounted on top) and which may not be used again, since the Antares launch system should be fixed by next year. Obviously this adds an element of excitement to the situation so be sure to tune in online to watch the launch. We expect there to be two live streams providing coverage; one will be NASA TV and the other will be provided by Orbital Sciences themselves. If the worst should happen, we have the contingency plan of promoting two of the Astro Pi engineering models to flight status: we made eight of them, two of which are flying into space leaving six ground units. ESA are committed to Astro Pi making it to the ISS and fulfilling our educational requirements. You can be sure that, whatever happens, it will fly in time for Tim to execute all the experiments. So please don’t lose any sleep! But antares had blasted and is discontinued now, right?By the way,I’m excited for the raspberry pi to reach the ISS. Antares is currently being readied for use with new engines since the explosion on the last flight was blamed on the 40 year old Soviet engines that were being used. Future flights will use modern new built Russian engines. I want a rocket! And this is a testing comment. So excited about the Pi going up on an Atlas V! 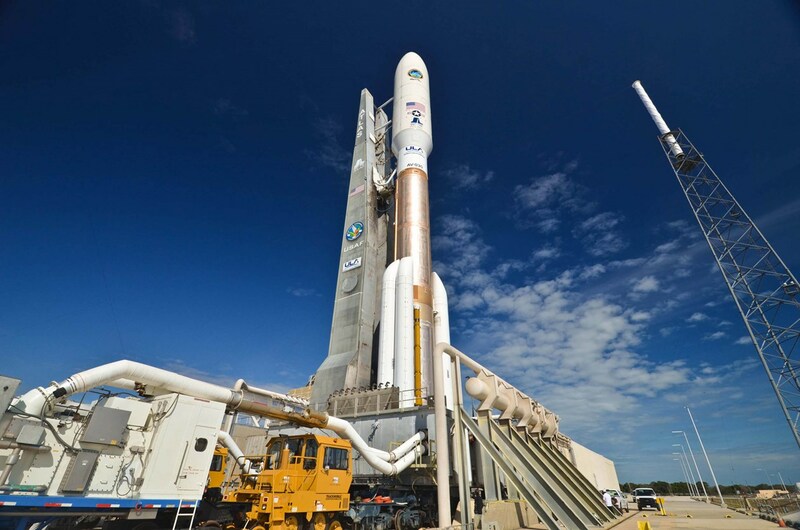 It will be launching from Cape Canaveral. If that picture of the Atlas V would have been taken from the other direction, you would have been able to see the building that they assemble them in. At the very top of that is a 60 Ton Crane that I have the privilege of working on. It’s very cool to be in the building with the vehicle inside. I was honored to be invited for the inaugural launch AV-001 at Cape Canaveral in August 2002, and for the inaugural launch of the Atlas V from Vandenberg AFB in March 2008. The Atlas has a very good record, with only one partial failure, and that was because of a leaky valve that caused it to run out of fuel 4 seconds early, so the payload missed the intended orbit. However the mission was still categorized a success. It has also carried the Curiosity rover to Mars. I’m very excited to have this distant connection to the Astro Pi program. P.S. For those sharp eyed folks, you can catch a quick glimpse of the Atlas V rocket and the crane in the 2013 movie “Europa Report”. and this is another testing comment. Can you even begin to imagine getting a BBC ‘B’ launched into space in 1985? And yet, here we are only some 30 years later . . . Schoolkids writing code to be executed on a computer floating in a Space Station, being crewed by folk who will be up there for months at a time – longer, in fact, than I spent living in a tent 600 miles from the South Pole (hiding from the Y2K bug back at the turn of the Millennium). In case anyone wants to practice launching from Earth and docking with ISS themselves, try out the awesome (and free) “Orbiter” space flight simulator (http://orbit.medphys.ucl.ac.uk/), which teaches you how the physics really work. Now we just need a version that will run on the Pi! I will be at the launch on Dec 3, as I am travelling in Florida, anybody there from the Raspberry fan club to view the launch together and have a celebratory beer afterwards ;-). I do not know rocket launching custom, but on a stage you never wish good luck, but toi toi toi instead. 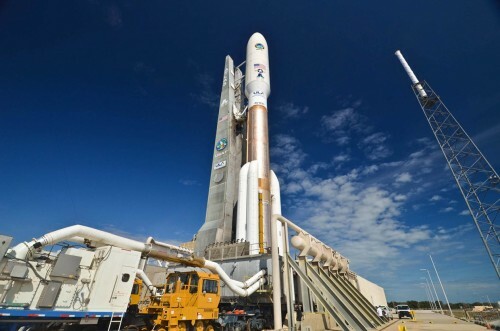 So a big toi toi toi to Raspberry team, the young coders, Tim and the Atlas V rocket!! !